The Hass avocado is known for its quintessentially tumbled leathery fairly thick skin that turns near black when fully mature. The flesh closest to the skin is a lush colored pale lime green and as it nears the central pit it develops a rich creamy yellow tone and softer, oil rich texture. 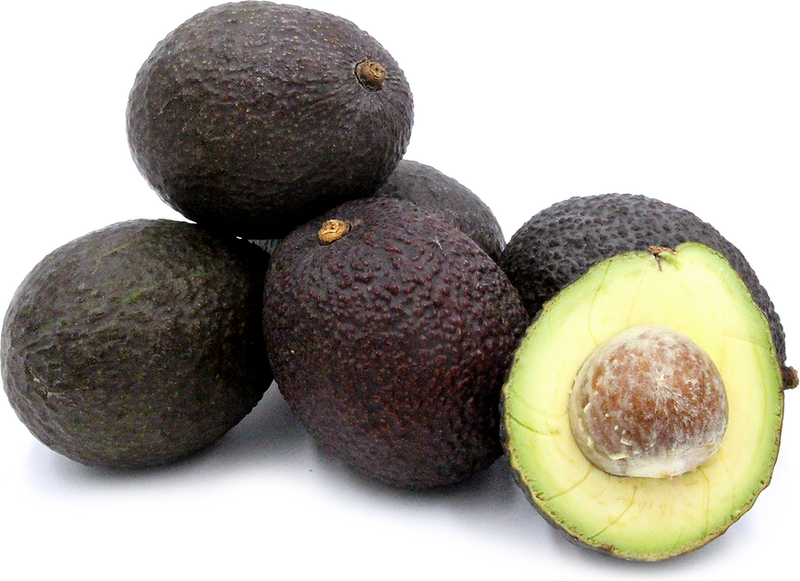 Hass avocado's flavor reflects its texture - creamy and smooth with a nutty and sweet finish. Hass avocados' grown at Garcia Farms are available from late spring throughout early fall. Though there are hundreds of varieties of avocados, the Hass avocado has become the benchmark avocado for commercial production. Its long growing seasons, prolific fruit production and shipping tolerance are virtues that make the Hass the standard market avocado. It is the avocado that the general public identify as simply, an avocado. Depending on the time of year, the avocado's fat content varies. In the early part of the harvest season, California avocados have a fat content close to 2 grams per ounce, while later in the year, they can peak at 6 grams per ounce. Avocados are rich in dietary fiber, vitamin B6, vitamin C, vitamin E, potassium and folate and are a good source of mono-unsaturated fat. To halve and pit a ripe avocado, cut in half lengthwise until reaching the center stone. Twist the two halves in opposite directions to separate. Remove the pit with a spoon. Carefully peel away skin. Avocados may be mashed, cubed or sliced, stuffed or pureed. To store, ripen fruit at room temperature. Refrigerate when ripe. Once ripe, use promptly for optimum flavor and texture. The Hass avocado is native to La Habra Heights, California where groves of avocado trees still flourish today. The very first Hass avocado tree was planted from seed (an avocado pit) in the early 1920's by A.R. Rideout. He sold a seedling to Rudolph Hass and it was that seedling that turned a single seed into a ubiquitous tree fruit. Rudolph Hass appropriately named the tree after himself and patented the fruit in 1935. The tree that launched millions more trees would bear fruit for 80 years before finally giving way to root rot, not uncommon among avocado trees. Although they need an incredible amount of water to bear healthy fruit consistently, avocado trees cannot tolerate overly irrigated soil or an abundance of rainfall. They prefer arid regions and semi tropical regions with well aerated soil. Recipes that include Hass Avocados. One is easiest, three is harder.